Dorie's recipe was very easy to follow. I love her step by step instructions...and all of the details she adds. The rising time was the only downfall...only because I was really craving a slice of cinnamony raisin goodness! The bread was well worth the wait. One slice in and I knew we had a winner. 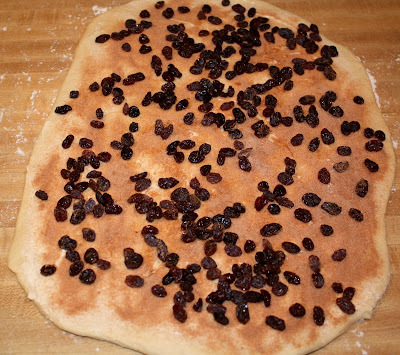 I loved the plump raisins and the cinnamon swirl! The bread was very "cakey" too. A divine sweet treat! 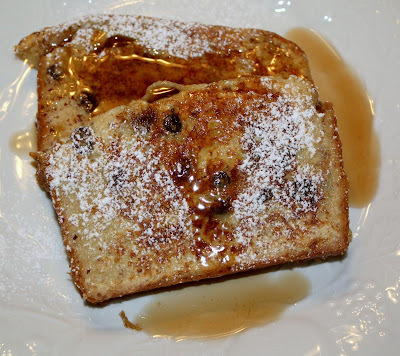 The bread was fine and dandy alone, but the next morning we were feeling adventurous, so we made french toast! The bread soaked up the egg, cinnamon, vanilla mixture quite nicely. We drizzled maple syrup and powdered sugar on top! This was the perfect vacation breakfast! Thanks Dorie! Oh-I taped another TV segment yesterday! It is airing on Friday on a local channel in Salt Lake City. This time the topic was "Healthy Snacking." I brought in examples of healthy snacks! It was fun! I hope everyone has a safe New Year's! We really don't have big plans, I guess we are boring! I just hope to stay awake until the clock strikes midnight:) HAPPY NEW YEAR! To make the swirl and shape the loaf: Butter a 9-x-5 inch loaf pan. Whisk together the sugar,cinnamon and cocoa, if you're using it. Check that the raisins are nice and moist; if they're not, steam them for a minute, then dry them well. Put the dough on a large work surface lightly dusted with flour, lightly dust the top of the dough and roll the dough into a rectangle about 12 x 18 inches. Gently smear 2 tablespoons of the butter over the surface of the dough--this is most easily done with your fingers. Sprinkle over the sugar mixture and scatter over the raisins. Starting from a short side of the dough, roll the dough up jelly-roll fashion, making sure to roll the dough snugly. Fit the dough into the buttered pan, seam side down, and tuck the ends under the loaf. Cover the pan loosely with wax paper and set in a warm place; let the dough rise until it comes just a little above the edge of the pan, about 45 minutes. Getting Ready to Bake: When the dough has almost fully risen, center a rack in the oven and preheat the oven to 375 degrees F. Line a baking sheet with parchment or a silicone mat. Melt the remaining tablespoon of butte and brush the top of the loaf with the butter. Put the pan on the baking sheet and bake the bread for about 20 minutes. Cover loosely with a foil tent and bake for another 25 minutes or so, until the bread is golden and sounds hollow when the bottom of the pan is tapped. Transfer the pan to a rack and cool for 5 minutes, then unmold. Invert the bread and cool to room temperature right up on the rack. Owww I use to love swirl bread when I was younger! I haven't had it in years. The french toast looks just awesome! Happy almost New Year! This is definitely a must try for me. Thanks for sharing! 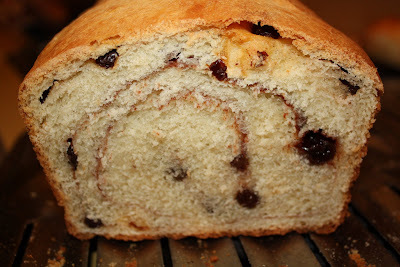 Maria, your swirl bread looks perfect! And did I spy some french toasts? yum! This recipe does look super delicious in the book and here. I might have to give it a try! Happy New Year! 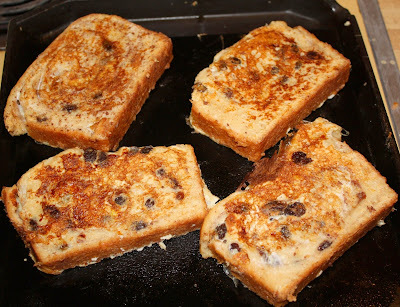 I love rasin bread and I always make our French toast using it. I have never made my own loaf before - thanks for the tasty recipe. I can't wait to try it. 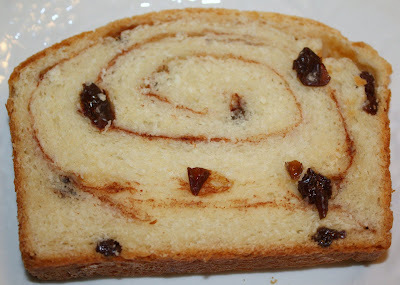 Oh man, does your raisin swirl bread look good. I'm going to have to remember this recipe. Looks fantastic... love the swirls. 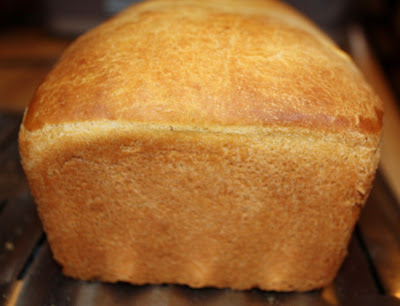 I would love to have some of this bread tomorrow morning...right now, in fact. I can't wait to try it! Happy New Year! That's so cool you make bread with your dad. I wish I could do that. YUM X 1000! That looks amazing! Dorie does make good stuff! I must say that I'm looking forward to trying this one and you're pictures just made me want it more. The french toast was a great idea. Happy New Year!! When I saw that first gorgeous picture I thought "Oh, that would make fabulous French toast!" Great minds think alike, for sure. I'll be passing this onto my dad, he loves to bake bread. Nice looking bread and even better french toast! Wow, you're becoming a TV star! Will you send me your address. I must have it wrong because I sent you something but it came back in the mail. I'm not a huge raisin fan, but have always like raisin bread. This looks delicious! Holy cow that looks good! I have to try this! Mmmm...that looks so good! I have this book and need to inspect it some more. The French Toast looks delicious as well. Looks like a fantastic job. When I first saw that initial picture - I immediately though something toasted with sweet cream butter - but hey - that french toast works too! Looks great Maria! I love how you "french toasted" it! Maria, how fun that you get to cook and bake with your dad! He sounds like quite a chef! This bread looks truly wonderful -- and I can't even imagine how fabulous it had to be as french toast! You are going to inspire me to conquer my yeast bread fear yet! This looks perfect! Great job, yum!! What a beautiful bread! Really magnificent and ever so tempting! Raisin bread is soooo good! I bet it tasted fantastic as french toast!